In Three Persons, One God: Growing in Relationship with the Father, Son, and Holy Spirit, Allison Gingras offers a primer in developing a personal relationship with the three persons of the Blessed Trinity. In her introduction, Gingras refers to the Gospel passage of Luke 8:4-15. That parable is about the farmer who went out to plant seed. Some fell on a footpath, where it was eaten by birds. Other seed feel upon the rocks where the plants sprouted but quickly died due to lack of moisture. The seed that fell among thorns was soon choked, but the seed that fell on fertile ground grew and produced a mammoth crop. We want to be the fertile soil that basks in God’s Word and spreads it to others, but how can we make sure that we are fulfilling that purpose? This is Gingras’ purpose in writing this book. 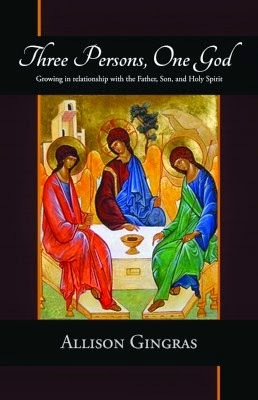 The first three chapters each focus on one person of the Trinity: God the Father, God the Son, and God the Holy Spirit. Gingras invites us to move into a relationship of trust with God the Father, to acknowledge the humanity and understanding of Jesus and to seek the great help that the Holy Spirit can provide. Each chapter provides the opportunity to look up relevant Scripture passages and to journal about one’s answers to reflection questions. The last three chapters further develop the qualities of God as compassionate, trustworthy, and forgiving. These aspects of God require a response from us. We need God’s love and we need to acknowledge that need. We can’t make it through this life on our own. God desires for us to love Him in return. This is why he gave us the gift of free will – so that we might choose to be in relationship with Him. We also need to accept God’s gift of forgiveness and, in turn, ask for that forgiveness when we have failed. As Catholics, we have the wonderful gift of the Sacrament of Reconciliation. The more we make use of it, the better our relationship with God will be. Three Persons, One God is a short book, designed for the person just beginning to want to deepen her relationship with God. Perhaps faith feels perfunctory or life simply feels like it is missing something? If so, then this book is definitely one worth reading. It is also a wonderful book to recommend to someone who wants to learn more about the three persons of God. It is easy-to-understand and emphasizes the personhood of God. Pope Francis lists a number of examples of young men in the Gospel, and remarked that young women might complain, “'Father, you are unjust … your examples are all men. What about us?' … You aspire in your lives to consolidate tenderness and fidelity. You are on the path of the women who followed Jesus, through thick and thin. Women have the great gift of being able to give life, of being able to give tenderness, of being able to give peace and joy. There is one model for you, Mary: the woman of fidelity, who did not understand what was happening to her but obeyed nonetheless; who, as soon as she knew her cousin needed her, ran to her, the Virgin of Readiness. Mary, who helped to raise her Son and to accompany Him, and followed Him when he began to preach; who suffered through all that happened to the boy as he grew. She who stayed by His side and told Him of problems: 'Look, they have no wine'. She who, at the moment of the Cross, stayed next to Him. … You are women of the Church … who is female, like Mary. This is your place. Being Church, forming the Church, being with Jesus, with tenderness, to accompany the Church and help her grow”. 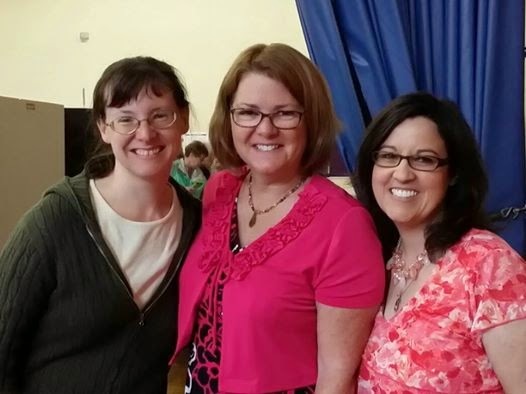 The Day I Finally Got to Meet Lisa Hendey! I first met Lisa Hendey of CatholicMom.com fame online over 10 years ago. She was always so kind and encouraging - a true mentor to me. She took a chance on an unknown writer and I soon became a regular columnist on her site. Many years later, she would give me the honor of writing The Catholic Baby Name Book, one of the books in her CatholicMom.com series. But, she lives in California and I live in Massachusetts and we had never met in person. Honestly, we've never even spoken on the phone. I arrived early Saturday morning. Lisa wasn't there yet, but I found where I was supposed to be and set up the table a bit. The woman setting up across from me was Allison Gingras of Reconciled to You. She and I are Facebook friends but I had never met her in person either. I had, however, promised to review her book about a year and a half ago and, for whatever reason, had never done so (a fact which I have felt badly about for a long time). She came over to Lisa's table (she also knows Lisa) and introduced herself and I introduced myself and apologized for my neglect of her review. She handed me a hard copy of her book and I promised to read it (and I did- The review will be coming this week!) Throughout the day, she and I spoke quite a bit. We had a lot in common and seemed to really hit it off. I feel like I made a new friend which is pretty awesome. Meanwhile, Lisa arrived about half an hour after I did. Unfortunately, she was suffering from laryngitis. She was the main speaker for the day and the poor woman could barely croak out a few whispered words. I think everyone in the place as well as all her social media friends were praying for her, and it worked! The Holy Spirit was definitely at work in her as she got enough of her voice back to give her inspiring talk (without notes! - I was in awe). Amazingly, after the talk, her voice went away again. She said that she has been praying for humility and God was providing it! God's ironic sense of humor was once again at work. Working at her table, I got to see so many women come up to her and tell her how her words had inspired them and spoken to them as if they were intended just for that one woman in the audience of over 400. It was incredible. Lisa is every bit as gracious and lovely in person as she is on-line. I don't know if I will ever get to see her again, but I am so thankful that I went out of my comfort zone and went to this conference. It was truly a blessed occasion. Today bring to Me souls who have become lukewarm, and immerse them in the abyss of My mercy. These souls wound My Heart post painfully. My soul suffered the most dreadful loathing in the Garden of Olives because of lukewarm souls. They were the reason I cried out: "Father, take this cup away from Me, if it be Your will." For them, the last hope of salvation is to flee to My mercy. Most compassionate Jesus, You are Compassion Itself. I bring lukewarm souls into the abode of Your Most Compassionate Heart. In this fire of Your pure love let those tepid souls, who like corpses, filled You with such deep loathing, be once again set aflame. O Most Compassionate Jesus, exercise the omnipotence of Your mercy and draw them into the very ardor of Your love; and bestow upon them the gift of holy love, for nothing is beyond Your power. Eternal Father, turn Your merciful gaze upon lukewarm souls, who are nonetheless enfolded in the Most Compassionate Heart of Jesus. Father of Mercy, I beg You by the bitter Passion of Your Son and by His three-hour agony on the Cross: Let them, too, glorify the abyss of Your Mercy. The pope gave Divine mercy the last word in his life. After entrusting everyone and everything into the hands of the Virgin Mary, he wrote in his will and testament, "I . . . ask for prayers, so that God's Mercy may prove greater than my own weakness and unworthiness: 'For with the Lord there is mercy and fullness of redemption (Ps. 130:7).'" If we recall nothing else as we watch the enormous crowd fill St. Peter's Square on April 27th - just as it did at John Paul II's unforgettable funeral Mass, only now without a trace of sadness - we can remember this mercy. 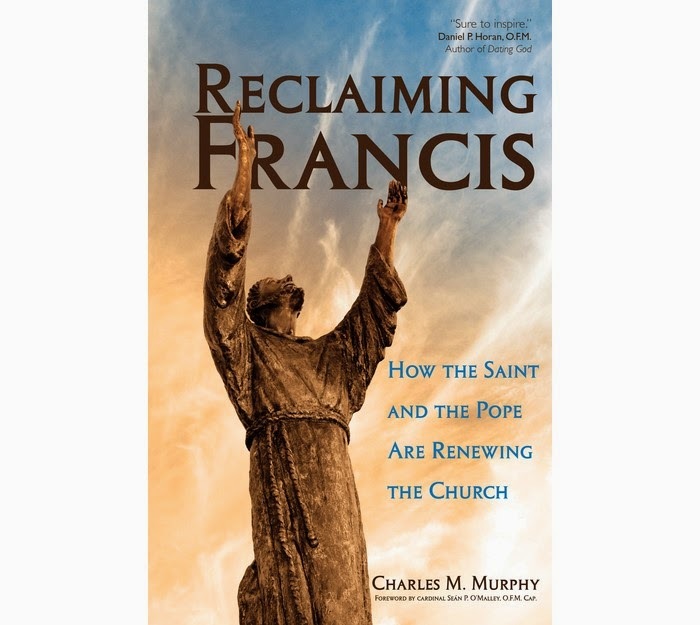 Ultimately, it is this mystery of God's love that shines through every one of the great pope's insights and, indeed, through his whole life. 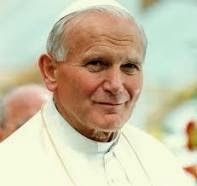 Everything John Paul II gave to the Church and the world that he so loved was - and is - an expression of this: God, rich in mercy, who gave himself to the world in his only Son. Eternal Father, turn Your merciful gaze upon the souls suffering in Purgatory, who are enfolded in the Most Compassionate Heart of Jesus. I beg You, by the sorrowful Passion of Jesus Your Son, and by all the bitterness with which His most sacred Soul was flooded, manifest Your mercy to the souls who are under Your just scrutiny. Look upon them in no other way than through the Wounds of Jesus, Your dearly beloved Son, for we firmly believe that there is no limit to Your goodness and compassion. Most Merciful Jesus, whose Heart is Love Itself, receive into the abode of Your Most Compassionate Heart the souls of those who particularly extol and venerate the greatness of Your mercy. These souls are mighty with the very poser of God Himself. In the midst of all afflictions and adversities they go forward, confident of Your mercy. These souls are united to Jesus and carry all mankind on their shoulders. These souls will not be judged severely, but Your mercy will embrace them as they depart from this life. Eternal Father, turn Your merciful gaze upon meek and humble souls, and upon the souls of little children who are enfolded in the abode which is the Most Compassionate Heart of Jesus. These souls bear the closest resemblance to Your Son. Their fragrance rises from the earth and reaches Your very throne. Father of mercy and of all goodness, I beg You by the love You bear these souls and by the delight You take in them: Bless the whole world, that all souls together may sing out the praises of Your mercy for endless ages. Amen. I recently had the great privilege of reading and reviewing a.k.a. 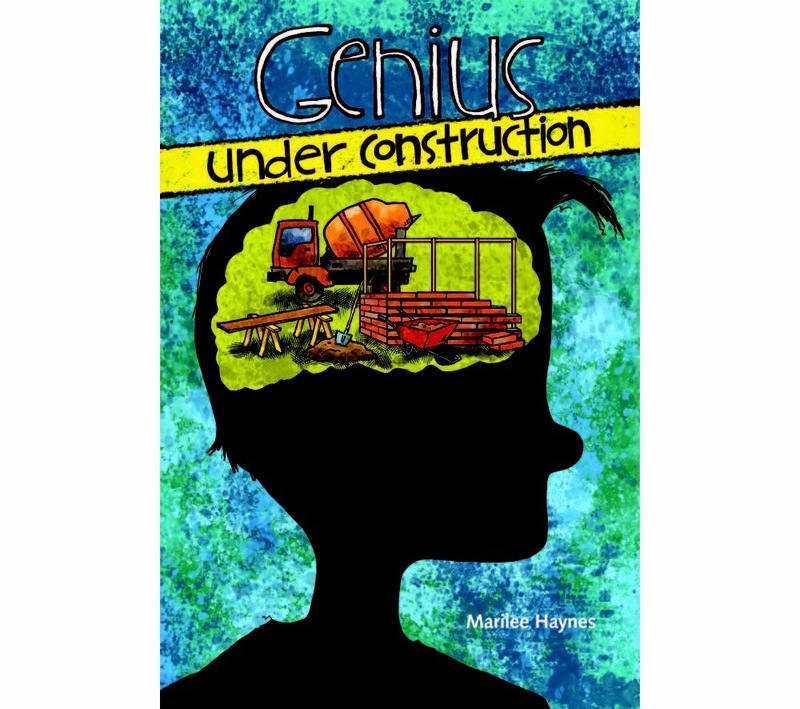 Genius, the first in a new series by Catholic writer Marilee Haynes, published by Pauline Teen. I loved the book and, even though it is aimed at middle-schoolers, found myself laughing out loud at many parts. It was a humorous, faith-based story with an important lesson that pre-teens and younger teens would actually want to read. How often can you say that? I handed the book to my thirteen-year old and told him he would enjoy it, and he did. He read it in one afternoon and was laughing so hard he literally fell off his chair! After finishing the last page, he informed me, “Mom, we’ve got to get the sequel.” So, I did what any self-respecting book reviewer would do, I wrote Pauline Media and asked (begged) for a copy. I was so excited when it came in the mail a few days ago, and even though I wanted to sit down and start reading it right away, I handed it to my son first, totally making his day. This time around, Gabe Carpenter is in eighth grade. While he has moved on from some of his seventh grade problems, he has plenty more to keep him busy. His second-best friend Maya is starting to do weird “girl” things and give him what his best friend calls “meaningful glances.” He has to do a service project and gets paired up with an ADHD 4th grader who can’t pass a spelling test to save his life. Perhaps most importantly, he’s trying to get into an elite math and science high school, even though he wonders if he wants to get in at all because it would mean leaving his friends. While this book isn’t as laugh-at-loud funny as the first one, Haynes has definitely created an excellent, enjoyable sequel. One wants to keep turning pages, eager to see how it is all going to work out for Gabe and his friends. In addition, she masterfully handles the story line about Harry and his ADHD, emphasizing how each person has gifts. I can only hope that Haynes will go on to write many more “Genius” books because I can’t wait to read them! I heartily recommend this series for any middle-schooler. Today bring to Me the pagans and those who do not yet know Me, I was thinking also of them during My bitter Passion, and their future zeal comforted My Heart. Immerse them in the ocean of My mercy. Most compassionate Jesus, You are the Light of the whole word. Receive into the abode of Your Most Compassionate Heart the souls of pagans who as yet do not know You. Let the rays of Your grace enlighten them that they, too, together with us, may extol Your wonderful mercy; and do not let them escape from the abode which is Your Most Compassionate Heart. Great and wonderful Lord, Almighty God, Merciful Savior. Hail, Queen Wisdom, may the Lord protect you with your sister, holy pure Simplicity. Lady, holy Poverty, may the Lord protect you with your sister, holy Humility. Lady, holy Charity, may the Lord protect you with your sister, holy Obedience. O most holy Virtues, may the Lord protect all of you, from Whom you come and proceed. There is surely no one in the entire world who can possess any one of you unless he dies [to himself] first. Whoever possesses one and does not offend the others, possesses all. And whoever offends one does not possess any and offends all. And each one destroys vices and sins. Holy Wisdom destroys Satan and all his subtlety. Pure holy Simplicity destroys all the wisdom of this world and the wisdom of the body. Holy Poverty destroys the desire of riches and avarice and the cares of this world. Holy Humility destroys pride and all the people who are in the world and all things that belong to the world. Holy Charity destroys every temptation of the devil and of the flesh and every carnal fear. Holy Obedience destroys every wish of the body and of the flesh and binds its mortified body to obedience of the Spirit and to obedience of one’s brother and [the one who possesses her] is subject and submissive to all persons in the world and not to many only but even to all beasts and wild animals so that they may do whatever they want with him inasmuch as it has been given to them from above by the Lord.